Dyscalculia or math disability is a specific learning disability or difficulty involving innate difficulty in learning or comprehending mathematics. It is akin to dyslexia and can include confusion about math symbols. Some people have called dyscalculia "math blindness" because those diagnosed with dyscalculia don't seem to be able to see what's being taught to them. Fortunately, like dyslexia and other learning disabilities, it's not that the person can't learn - it's more about finding the best way to learn math. One thing you won't find anywhere else are the lessons we teach in our Dyscalculia Toolkit. We show you wonderful ways to help students learn math - and we provide it to our friends, readers and visitors free - here. There's no real online dyscalculia test, per se. Determining whether you have dyscalculia or not really should be left to someone who can speak to teachers, parents, see past work and really talk to the student. Distractions, ADHD, poor learning environments, age and other factors can all contribute to poor math skills. Dyscalculia is something special to the way the brain operates. Please take a look at the many articles we've written on the subject. We've covered everything from the symptoms to the causes to the diagnosis to the treatment. We invite you to not only read more, but feel free to call us and ask questions. It's our passion - and we'd love to help. In fact, fun math games are better than text books! To some children, math can seem daunting and tedious, especially if they suffer from learning disabilities, such as ADHD and/or dyscalculia. 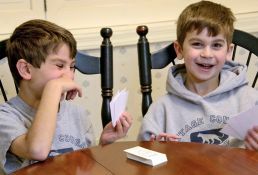 In cases where the child is showing difficulty grasping a math fact, fun math games can be the perfect activity in bridging the gaps that become obvious and creating the element of fun while learning the math facts. 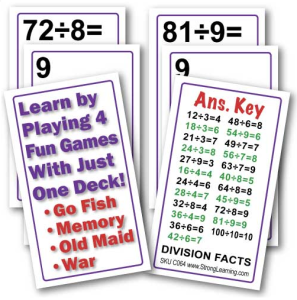 All math is built upon a foundation of memorizing simple math facts, which is why finding math fact games can be so crucial to children, especially those with ADHD and/or dyscalculia who aren’t inclined to learn as fluidly from a worksheet. Repetition is key to being successful in producing a firm foundation for all other math to build upon. Math Fact Games are perfect for having fun while learning. Hoping to become a psychologist, a 28 year old friend of ours asked for our advice in overcoming adult dyscalculia. Her worry was the math section of the GRE exam she would have to pass to get into a good graduate school. Her worry certainly isn’t unwarranted, but there are ways to get around adult dyscalculia. Taking the GRE math course isn’t going to be easy, but first give it a try by taking a prep course or hire a qualified math tutor who can teach strategies and sufficient math skills in order to pass. However, that certainly won’t guarantee a good score on the exam. Before going through all the anguish and expense of a course or private tutoring, contact the colleges of interest and explain the situation. They help solve problems like this, and likely will be interested in helping overcome adult dyscalculia as well. When calling, speak to an admissions counselor, or the chair of the Psychology Department or the dean of the graduate school in psychology. Whether it’s psychology or a managerial position at work, what have you got to lose? On the flip side, think of what you have to gain by initiating an open discussion with folks? (Not every one understands how quirky the brain can be about learning certain things, so use discretion if awareness of the issue would negatively impact the situation long term. There are yet other options, first. )Before taking the GRE or even preparing for it, research graduate schools and their requirements. Some universities may not require the GRE. Research thoroughly because they have many other requirements that are similar. Many wonderful opportunities are out there, so keep researching. Finally, remember that everyone has strengths and weaknesses. It’s important in life to find your own strengths and go with them. Don’t ruin your life with sadness or pity by dwelling on the weakness. If there is no way around math think of other options. What’s often hard for people to budge from is the vision they’ve created for themselves at a certain school or in a certain job. But the fact is there are always ways to be doing what you love with a different title or address. Sometimes the process of overcoming adult dyscalculia means those of us who have it must dig a bit deeper to find the gold. As an example, licensed clinical social workers (LCSW) can have very similar careers as psychologists including private practice work as psychotherapists. Often the requirements are less stringent for this degree. Many other helping careers may not require math. Make an appointment with a career counselor privately or at a nearby college to explore your options. There’s more than one path to take to find the right career. Yes, there is a dyscalculia test! Thousands of children, teens, and adults, go through life with a math disorder called dyscalculia. Often it goes untreated. Parents say kids are lazy. Teachers complain that they’re not trying. And friends think they’re making it up. With their parent’s permission, students can take a dyscalculia test to determine whether they are affected by it or not. Crying while doing math homework? Switching to addition while doing a subtraction problem or vice versa? Forgetting addition facts and multiplication facts? Failure to remember math steps? Older students who have difficulties with math can bring this list to the attention of their parents and teachers and ask if the adults will consider testing for dyscalculia. We have been testing students for dyscalculia for years and find these questions very helpful in determining whether testing is needed. Students should try to provide details instead of just “yes” or “no.” Specific examples and additional comments on how the student has been coping with the problem will help. 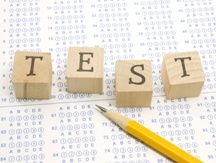 The school can evaluate if a student has a math disorder by comparing his abilities to his score on a math assessment. When a significant discrepancy occurs, schools will provide remediation. When a school modifies math courses to better match the student’s needs, math becomes easier. With this modification for a math disorder, students often achieve at or above the level of their peers. Keep numbers in columns by turning lined paper sideways so the lines become vertical guides. Cover up all columns except those being worked on. Use a calculator when appropriate. Circle the + , –, or other arithmetic signs before doing the computation. When working on a word problem, write down the information and what you’re trying to solve for. Use whatever method works best for that task such as making a list, drawing, or underlining. Stay on task when doing math problems by talking to yourself out loud if you’re alone or sub-vocalize. Children and teens do not have to suffer low grades and poor test scores in math. 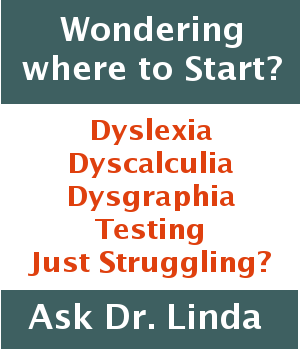 Dyscalculia Testing followed by appropriate modification at school or tutoring helps. We’re huge fans of fun. 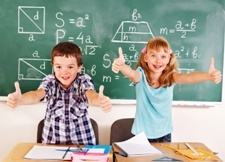 Dyscalculia treatment doesn’t have to be hard, or boring, or long. . .it can actually be fun. Kids facing challenges with reading, writing or math? Sign up for my newsletter and find out how to help them overcome them with fun games and activities that keep them engaged. Copyright © 2019 DrLindasBlog.com. All rights reserved. This site is a division of Strong Learning, Inc.